Ataxx is a game on a square board (7x7 fields) for two players. The gamer (white pieces) plays against the program (black pieces). 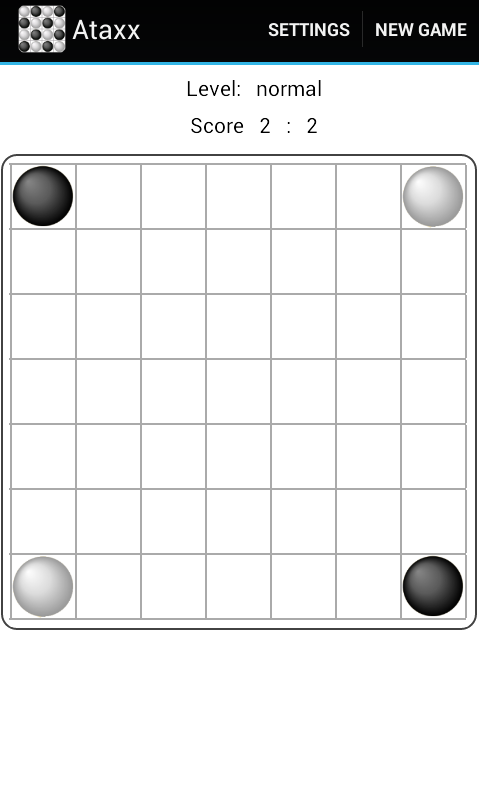 At the beginning of the game each player starts with two pieces; white begins. When it is his turn, the gamer moves one of the white pieces one or two spaces vertically, horizontally or diagonally to a target field. In the target field, a new piece of the same color appears. When the piece has been moved only one space (in the green area), the original piece is maintained. However, if the piece has been moved two spaces (yellow area), the original piece disappears and only the new piece is maintained. All adjacent pieces around the target field change their color: e.g. when the gamer moves a white piece to a target field next to black pieces, those black pieces become automatically white. The game ends when all fields on the board are filled or when a player has no more possibility to make any move. The winner at the end of the game is the player with highest number of pieces on the board. Using the traffic light the strength level of the opponent (easy, normal or hard) can be controlled.